Flair up your Salmon fillets with the sensational blend of Cajun-inspired spices. Serve with steamed vegetables and rice. 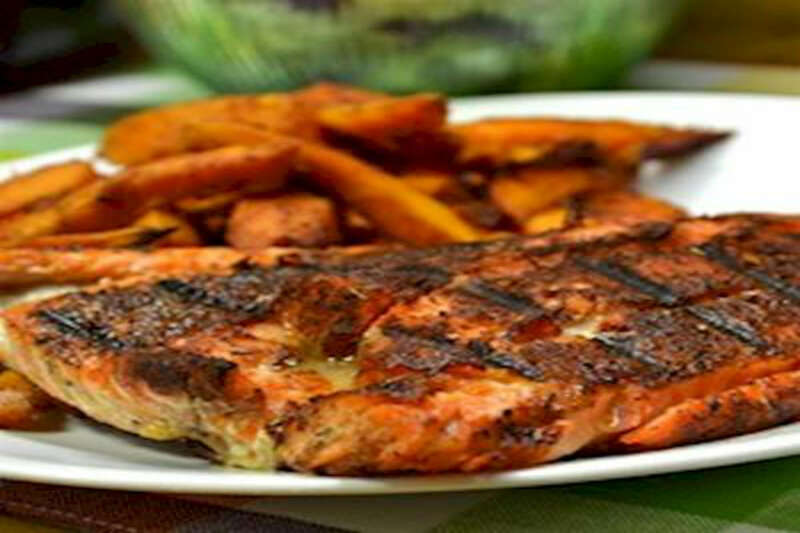 RecipeSavants.com Flair up your Salmon fillets with the sensational blend of Cajun-inspired spices. Serve with steamed vegetables and rice. Smart Recipes, American Recipes, Fish Recipes, Recipes Fish American Blackened Salmon Fillets PT20M Serves 4 Ingredients: 2 Tablespoons Ground Paprika 1 Tablespoon Ground Cayenne Pepper 1 Tablespoon Onion Powder 2 Teaspoons Salt 0.5 Teaspoon Ground White Pepper 0.5 Teaspoon Ground Black Pepper 0.25 Teaspoon Dried Thyme 0.25 Teaspoon Dried Basil 0.25 Teaspoon Dried Oregano 4 Fillets Salmon 0.5 Cup Unsalted Butter Whisk together all the ingredients except butter and fillets in a bowl and set aside. Drizzle fillets with 1/4 cup butter on both sides and rub evenly with the spice mixture. Now drizzle 1/2 cup butter on one side of the fillets. Place fillets in a heavy skillet, butter side down and cook until blackened, about 2 to 5 minutes. Turn fillets over, drizzle with remaining butter and cook until flaky.